Still relatively undiscovered , the region of Friuli Venezia Giulia, bordering with Veneto, Slovenia and Austria, lies at the North-East part of Italy and includes the Alps, lakes, hills, sandy beaches, vibrant cities and historical sites. It was in fact called a “compendium of the universe” by the writer Ippolito Nievo. The house for short term rentals (minimum 2 weeks) is situated in the town of Cormons, at the very centre of Collio region, renowned world wide for its superb wines, Pinot Grigio, Sauvignon, Friulano (previously called Tocai) and fabulous reds like Refosco, Pignolo, Cabernet, Merlot. A day of wine tasting? Wineries can be easily visited and wine tasting, or vinegar tasting if you wish, is one of the many activities you can enjoy while there. A day of history and art? From Cormons you can go visit delightful, culturally vibrant cities like Trieste (52 Km. away) Udine (18 Km. away) Gorizia (12 Km.) or search for history in Roman Aquileia (35 Km. ), a heritage Unesco site, visit the Longobard town of Cividale (12 Km. ), or the majestic Napoleon’s former residence, Villa Manin di Passariano, now an important art museum. Aquileia’s Romanic cathedral, famous for its ancient mosaics. Villa Manin, a neoclassical villa, one of the famous Ville Venete. A day of Vespa riding? La dolce vita re-starts from here says the above poster, because you can also take advantage of the recent program Collio with Vespa and move around easily with the iconic Vespa scooter, for rent in Cormons. A day of horseback riding? If Vespa is not your favorite way of transportation, why not spend a day out horseback riding; from the Subida Riding Club follow the trail of the high vineyards, with its magnificent views, for nice excursions. A day of bike riding? A biker paradise, with clearly marked bike routes, clean roads along vineyards and orchards. A golf course is 3 Km. from the house, at the Castle of Spessa, a luxury resort. Here you can also visit the centuries-old cellars, have wine tasting or dine in the superb restaurant. A day of gourmet food? Friuli-Venezia Giulia has a variety of recipes, with influences from Austria, Hungary and of course the near Veneto region. Slow Food movement was born in Italy and in this region has even more importance. Most restaurants use exclusively local ingredients and menus always offer what is in season. Sacher, a chocolate cake from the Austro-Hungarian tradition. Many extraordinary restaurants are in Cormons or nearby, some where featured on TV by famous New York restaurant owners Mario Batali and Lidia Bastianich, the latter has also a farmhouse and a winery very close to Cormons. You can choose to tan and swim in the crystal clear waters along Trieste coast. or the vast sandy beaches of the Island of Grado also called “The Golden Island” for the color of its sand. The island of Grado (linked by a bridge to the inland) is only 45 Km. away and offers superb lagoon wildlife, a bird sanctuary and miles of beach. The ancient part of the town has important Romanic architecture and its narrow pedestrian walks are similar of the ones in the near city of Venice. Venice is only 80 Km. away and it is easy to go there for a day trip, either by car on easy highway or by train. Cormons is situated near the border with Slovenia and only 110 Km. to its capital, the beautiful and vibrant city of Liubljana. 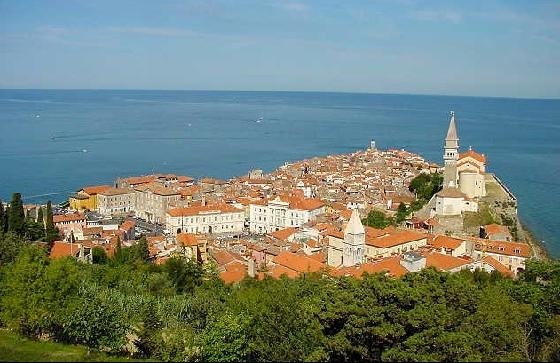 not to mention the splendid coast of Istria with quaint fishing villages or luxury resorts and spas. Even if the house is a base for all the above excursions you may enjoy a day relaxing at home and maybe taking just a short walk to the center of town for groceries shopping in the lively open air market (every Friday) or the numerous specialty stores. The portion of the house for rent is about 2,500 square feet, on two levels (the remaining part on the turret is not restored yet) and has three bedrooms, two full bathrooms. The living area downstairs is very large with an open living and dining area, a large kitchen and a family room off kitchen with a table for six. The courtyard and the covered terrace offer some place where to read or relax outdoor. Rates: please send a request and be assured that it will be much less than staying at hotels and much more comfortable! Sorry but no smoking allowed. "Comfortably ensconced in this large and well-outfitted home, I enjoyed every moment exploring the stunning and largely undiscovered (by North Americans anyway) region of Italy: Friuli-Venezia-Giulia. Even the name Friuli-Venezia-Giulia I loved to repeat, rolling off the tip of my tongue, a region full of sensual delights: the wines of the Collio, cultivated in the handsome vineyards covering the sweeping hills surrounding Cormons; incredibly superb farmhouse restaurants and world-famous gourmet restaurants a few minutes drive from the house; the town's delicatessens featuring large assortments of local cheeses and cured meats and breads - I wanted to try everything, and I almost did. The people are also charming and friendly in this region, not jaded by ultra tourism as often found elsewhere in Italy. Nearby city destinations range from Udine (my favorite), a distinctly Venetian city, small yet sophisticated; Trieste, grand and Hapsbourgian yet folksy at the same time; Grado, a beach resort where, like me, you may happen upon singing at a characterful local wedding at an ancient church; Cividale, a lushly idyllic, ancient riverside town; and Aquileia and the vast stunning Roman mosaics of its cathedral. And don't let me forget to mention my two favorite drinks (besides the region's justifiably celebrated wines and grappa) - Aperol spritz (discover this soothing, orange afternoon drink), and Pelinkovac, an unforgettable herbal bitter with a hit as mighty as Absinthe." "Had a wonderful stay in this very comfortable classic Italian home. It was just a few minutes walk to the center of Cormons, a beautiful quaint Italian town where we soaked up the local culture and savored the area's cuisine. While touring the surrounding countryside we would pick up fresh produce from the local farms and stop by the vineyards before heading home. This would have been a great place to tour by bicycle. Maybe next time!!!!!" " I loved being there in that cozy beautifully furnished old home. Friuli is a part of Italy I had never seen before and very different front he parts I know. Cormons itself is a wonderful little town. It was great to be in northern Italy and be able to drive around the gorgeous countryside, see the vineyards, visit the Roman ruins and great mosaics of Aquileia, see Grado with its lovely harbor, cathedral and streets that reminded me somehow of Venice, see the ancient and mysterious Longobard church in Cividale, and finally travel to Trieste to see Miramare castle and the very intriguing city itself. The house is such a comfortable place and a lovely spot to stay when exploring Friuli." "My sister and I had a wonderful time and we still have fond memories of our stay in this area. The house is an oasis of peace and quiet and exhudes an air of charm and refinement. It was the departing point of many trips in the area, Cormons is a delightful little town where we ate wonderfully. We took a few wine tasting tours in the nearby towns and we cannot forget the out-of-this world cheeses we tasted. Thank you for making our stay so memorable!" 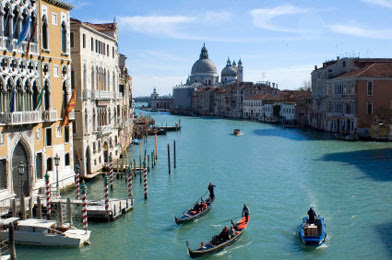 This blog is about travel, with a focus on Italian design, art and culture. Please follow me on a journey to my country.